In the Seminar on Anxiety we have, on the contrary, an elaboration which rectifies this detour, this necessary going astray, in order to restore the partial object to its place as object-cause. The partial object is put back in the place of cause under the types described as remainder and left-over. Desire is conceived as a cut, null, separated object that has been let go of, which the subject has transferred, and whose paradigm is the objet a. From this Seminar, one can deduce a direction of the cure from his point that the analyst is not fascinated by desire, or even by the interpretation of desire; what must be interpreted is on this side of desire. The object-cause must be interpreted. 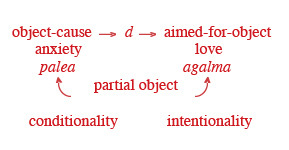 Lacan will say later that interpretation bears on the cause of desire, but this is where the change in the point of application of interpretation is outlined. The first time that Lacan proposes this still-mysterious object-cause, he illustrates it by the fetish of fetishistic perversion. It is here, he says, that the dimension of the object as cause of desire is unveiled; the fetish is not desire, but it must be there in order for there to be desire, and desire itself is going to stick around wherever it can. You see to what level the fascinating object of desire has fallen. It is no longer any old place where desire is going to stick around: it must be there. One can already, in this "be there," see Dasein, from which Lacan will characterize as the objet petit a, resonate. What Lacan develops in this Seminar is an object which is the condition of desire, and this condition is distinct from intention. It is the conditionality of desire in relationship to what was once its intentionality. L'orientation lacanienne, Paris, Spring 2004 - text and notes in French edited by Catherine Bonningue and published in la Cause freudienne 59, Paris, February 2005.